Do you want to maximize your online presence and hit your sales targets? Looking for ways to boost traffic and outrank your competitors in the SERPs? In this article, I’ll highlight 7 benefits of listing your LMS in eLearning Industry’s exclusive LMS directory. Promoting your LMS product requires a significant amount of research, resources, and planning. Not to mention, patience. It’s a competitive industry, which means that you have to make your software stand out from the rest. This can be a tricky task when you’re working with a limited budget. Or you are new to the industry and need to fast-track your brand building efforts. Fortunately, there is a way to market your LMS solution with minimal effort and resources. Here are 7 of the most notable advantages of listing your LMS in our LMS directory. Directory visitors are high-intent buyers looking for helpful advice on which platform will help them achieve maximum resource allocation. They’re prepared to do their homework and compare the top platforms to find the one that checks every item on their list. Often, they are organizations who are ready to make the switch from traditional to online training. They’re on the hunt for a solution that is going to help them globalize their online training initiatives and cater to their ever-expanding workforce. eLearning industry's LMS directory is custom-tailored to these individuals who want a top-notch tool minus a headache. They can view all the options that fall within their criteria in one centralized spot, rather than having to conduct an exhaustive online search, only to discover that their ‘shortlist’ is a mile long. An LMS directory listing gives you the ability to enhance your SEO, thereby increasing your visitor stats. Not to mention, conversion rates. This is due to the fact that you are targeting high-intent buyers who are more likely to click that ‘Buy’ button. You can include specific keywords to raise your visibility in the search engines and earn organic traffic. A directory listing also gives you backlink benefits. You’re able to redirect prospects to your LMS landing page or website, so they can learn more and make a better-informed buying decision. In turn, this brings your site to the attention of Search Engines (in a good way), so that you’re more relevant and indexed higher. Prospective buyers are more likely to invest in your platform if it’s tried and tested. The trick is that most people aren’t willing to sign up for a free trial or demo without a solid track record. Fortunately, there is a loophole, which comes in the form of trusted LMS reviews and ratings. 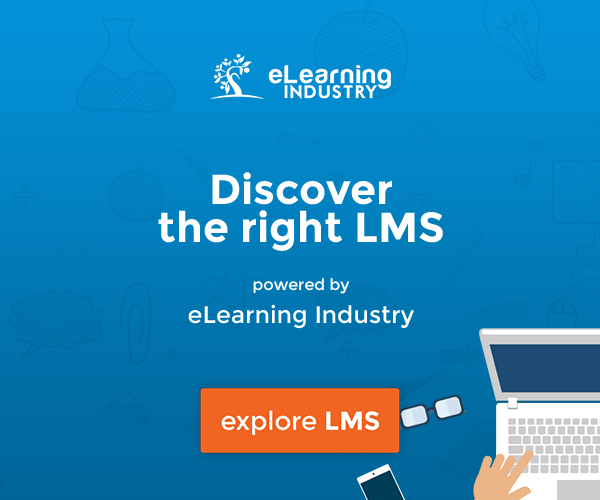 eLearning Industry’s LMS directory gives users the chance to share their thoughts and opinions about the platform. Which provides your LMS with significant social proof. They can even see the reviewer’s industry, use case, background, title, and other crucial details. That way, they know it’s coming from a reliable source with similar LMS requirements, instead of blindly trusting testimonials that you post on your landing page, which lack provenance. ‘Top 20’ lists are so popular because they give readers a targeted overview of products, sites, businesses, etc. Potential buyers can quickly see who has risen to the top, why, and how the product will suit their needs. When you list your LMS software in eLearning Industry’s LMS directory, you’re in the running for the Top 20 LMS. Which gives prospects the ability to see which platforms offer the best User Experience and customer experience. Better still, these lists are backed by credible user ratings. People who have used your platform can share their positive experience and help you rise in the ranks. Attract the right LMS software buyers to your most converting landing pages by launching a PPC campaign. It’s as easy as creating a free LMS directory listing, then setting up a targeted PPC strategy. You get to control your spending thanks to transparent geo-bidding and budget caps, as well as monitor your results and track specific KPIs with the help of detailed graphs and reports. All this gives your LMS the chance to outshine the competition and outrank other LMS platforms in the directory. Potential customers may not be aware of the key features your product offers. This is your chance to highlight anything and everything that’s great about your LMS software. Even something seemingly insignificant might be a deal-breaker for LMS users. LMS features will also be displayed when users access the comparison tool. This allows them to compare three top LMS platforms in a side-by-side list, then learn more about the tool that offers more pros than cons. Listing your LMS on eLearning Industry’s LMS directory is a cost-effective way to drive traffic to your site, build a social media following, and enhance your image. Visitors are already interested in an LMS. As such, they are more likely to invest in your product. At the very least, they might sign up for an LMS free trial or demo to ensure that the tool meets their needs. This gives you the power to prove the value of your software and emphasize its real-world benefits. Users get a first-hand look at how your LMS platform will improve their online training efforts and ROI. Generate more leads from your listing and get higher conversion rates from your 1st PPC campaign. Your LMS overview must be brief (250 characters max. ), which means that you have to make every word count. Try to incorporate keywords or phrases into your description to improve SEO. However, keep it organic so that it’s an easy read for site visitors. It’s also wise to include buzzwords that your target audience is looking for. For example, mention that your tool is intuitive and that you offer a broad range of support services. That selling point will attract organizations who want a tool with a low learning curve, as well as newer eLearning professionals who may require more assistance while they build practical experience. Finally, review your LMS listing to ensure that it’s error-free. One spelling error may put a potential customer off of your product and diminish your credibility. eLearning Industry’s LMS directory offers you the chance to spread the word about your product and increase your online sales, especially if you keep our top tip in mind when creating your LMS overview. If you still have questions please feel free to get a free LMS consultation from our experts. They will help you create your LMS product listing and show you how to generate more leads and get higher conversion rates from your 1st PPC campaign.